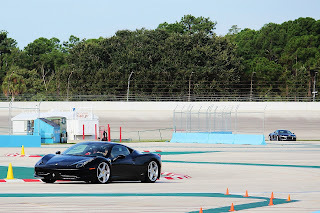 Kingdom Konsultant Travel Blog: Life in the Fast Lane at the Exotic Driving Experience! Life in the Fast Lane at the Exotic Driving Experience! A few weeks ago my husband and I celebrated our fifth wedding anniversary at Walt Disney World. While planning this trip, my husband had gotten wind of the new Exotic Driving Experience. I started picking up on little hints that he might want to drive one of the exotic cars, specifically the Ferrari 458 Italia. The wallpaper on his computer, his phone and his iPad had all been changed to pictures of the car. He was watching videos on YouTube of the Ferrari and frequently asking questions about the experience. I tuned into his hints and as a birthday/anniversary gift, I booked him the drive experience for our trip. To say he was excited would be an understatement! 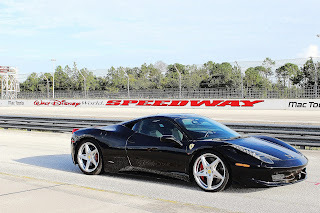 The Exotic Driving Experience is fairly new to Walt Disney World and began running in January 2012. The Exotic Driving program along with the Drive Petty experiences, are hosted at the Walt Disney World Speedway, located past the Magic Kingdom Parking lot, opposite of the Transportation & Ticket Center. Guests can choose from five different exotic cars to share their experience in: the Ferrari 458 Italia, Lamborghini Gallardo LP570-4, Lamborghini Gallardo LP460-4, Audi R8 and the Porsche 997 S. The prices for these cars range from $169 - $419 (plus taxes and fees) for a 6 lap experience. Additional laps can be added on for extra cost. If you’d feel more comfortable leaving the driving to the professionals but want to experience what these cars are made of, you can purchase a 2-lap Thrill Ride experience for $99. Drivers and thrill riders are asked to arrive to their experiences no later than 30 minutes prior to their booked time. While some guests may rent a car and just drive to the track, those relying on the Walt Disney World transportation system can rest assured that getting to the track isn’t too difficult. Located at the front of the Transportation and Ticket Center next to where the old kennels were located, a shuttle van for the Walt Disney World Speedway is available. The shuttle is available approximately every 15 minutes and will bring you right to the front door of where your experience will begin. No appointment is necessary for this shuttle, but do allow yourself plenty of travel time to be sure you arrive 30 minutes prior to your experience. Once arriving at the track, drivers and riders will need to check in, fill out any necessary paperwork and pick up their badges and bracelets. Bracelets you ask? These bracelets aren’t actually jewelry, but do play an important role in your experience! Each rubber coiled bracelet has a thumb drive attached. This thumb drive is used to record in car video footage of each ride which can be purchased after the experience. After checking in and filling out forms, drivers and riders are brought into a briefing room where they watch a video, talk with an instructor on what to expect and how to navigate the course, and can ask any questions they may have. Guests of the experience participants are also welcome to watch and sit in on the briefing. ﻿﻿﻿﻿﻿After everyone is checked in and has been informed on how the experience will go, participants and their guests are brought outside to where the action begins. Drivers are called up to the cars they will be driving for a mini photo shoot – one picture standing next to the car, and one in the driver’s seat. Along with the video mentioned previously, these photos are available for purchase after the experience. Once the pictures have been taken, the participants are held in a seating area under the outdoor pavilion to hear in what order they will be driving in(numerous drivers can be booked for each car). Guests of the participants can head out across the parking lot to a small bleacher style seating area with a front row view of the experience as it happens. It’s a great spot to take photo and video. Well, in my case it was photo, camcorder video and iPhone video at the same time! Participants who are not first in line for their experience can also watch over here before and after their experience. An attendant is on hand to let participants know when to go to their car to get ready for their drive or ride along. 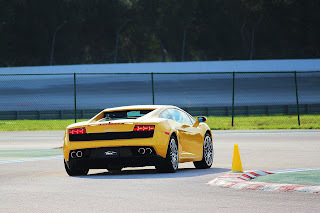 Those partaking in a drive or thrill ride will get to experience hands on the speed and handling that these super cars are made of on both the track itself as well as a handling course. The speed, the braking and the handling of these cars is just superb. I really believe I could have sat on those bleachers for another 3 hours just watching, they were that nice. And watching and hearing all of these amazing vehicles made me quite jealous of my husband! I wanted to be in the driver’s seat - or at least the passenger seat (but I couldn’t be too jealous, I did get to have a thrill ride experience back in January in the Porsche)! Once the experience is over, participants bring their thumb drives in and can watch clips of their in-car video to decide if they would like to purchase it as well as look at the photos that were taken. Along with purchasing just the photos, there is an assortment of plaques available for additional cost which photos can be placed in. There is also a gift shop here that carries souvenirs such as hats, shirts and key chains for guests to purchase. Once guests who are using Walt Disney World transportation are ready to leave, one of the attendants can radio in for the shuttle to come pick them up. Guests will be dropped off at the same location where they were picked up at the Transportation and Ticket Center. Before I end this blog post, I wanted to leave everyone with some parting thoughts courtesy of my husband. After the experience, he couldn’t stop smiling, even with a horrible case of helmet hair. He loved every second of it. He only had one complaint and that was that it ended. He could have driven that car all day if they let him (what guy couldn’t)! Next time he does the experience, he said he is going to try a different car (he's on a mission now to drive each car). Also, he's already insisted he is going to purchase extra laps for extra drive time. This was the highlight of our trip for him and he still talks about the Ferrari every single day (and has watched his video countless times as well). And as for me, I’d say it made one awesome anniversary gift. We can’t wait to get back to the track again!